Despite the long bull market, more Americans today have more debt than money in the bank than at any point since 1962, according to Deutsche Bank. American household savings levels are at levels last seen in December 2007… right before the economy slipped into a recession that spurred the global financial crisis. And total U.S. consumer debt – credit cards, auto loans, and student loans – just surged by the most in two years to $3.8 trillion. And government debt… is creeping toward a $1 trillion deficit per year. The national debt has topped $20 trillion. If these folks can’t save or make their payments in a strong economy… how will they do it when interest rates go up and the next inevitable recession hits? The answer is that they won’t. “Here’s a chart based on research from the Economic Policy Institute that describes the problem. 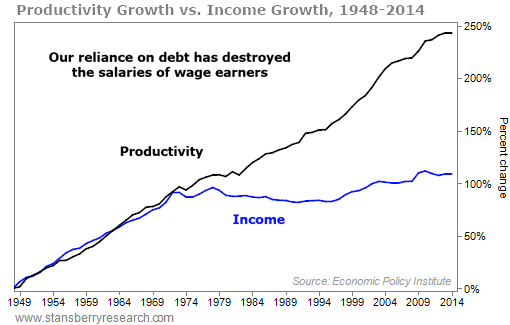 As you can see, productivity in this country grew nearly 250% between 1948 and 2014, but median wages only grew 109%…You’ll also notice that the divergence begins around 1971… the year President Nixon removed the U.S. dollar from gold. Why? Because paper money doesn’t transmit gains in productivity like real, sound money should.